The Isle of Man TT Mountain Course reverberated to the ear-splitting sound of Classic bikes as qualifying began in the inaugural Classic TT Races presented by Bennetts. The eclectic mixture of machines on the course featured some of the finest names in Motorcycling history including Aermacchi’s, AJS’s, BSA’s, Patons, Benellis, Velocettes, Matchless, Vincent, Enfields, and a smattering of Moto Guzzis, the sound of which was memorably described by Manx Radio TT commentator Roy Moore as ‘the Italian National Anthem’, alongside Classic machines from the Japanese manufacturers, while a number of Nortons and a few Triumphs ensured that the high profile British manufacturers earlier machines were also represented. Oil on the track at Greeba Bridge and Barregarrow delayed the start of the Classic session, and ultimately resulted in the Classic riders only getting a single practice lap, although some of the riders went out earlier in the MGP session. The Classic only practice eventually got underway shortly before 8pm with riders warned that there would be lack of adhesion flags displayed at the oil spills. A number of the leading TT riders took to the track for their first experience of Classic Racing on the Mountain Course in the untimed session including Bruce Anstey on the McIntosh Norton, Cameron Donald on the Matchless, Ian Lougher on the Royal Enfield, Conor Cummins on Tony Dunnells Manx Norton, Steve Mercer and Dan Cooper representing the Yamaha Classic Race Team while experienced Classic Racer Olie Linsdell was also prominent on the Giovanni Cabassi Paton. Gary Johnson went out on a 1250 ‘Harris’ and also got out on his Lincs Lifting MV Agusta, while Nick Jefferies, the ’93 Formula One TT race winner, also returned to the Mountain Course for the first time since 2002, riding a Honda. Twenty-time TT race winner John McGuinness, who arrived on the Island earlier in the day having competed in the World Endurance round in Germany at the weekend, rode the Team Winfield Paton in a much-anticipated appearance, with McGuinness getting into the spirit of the event by wearing retro leathers and a historic Shoei helmet, complete with Lancashire red rose. Although the session was untimed, riders took advantage of the session to get in practice ahead of tomorrow’s first timed session with no one pushing it more than Michael Dunlop, on the Team Classic Suzuki XR69, first back to the Grandstand. 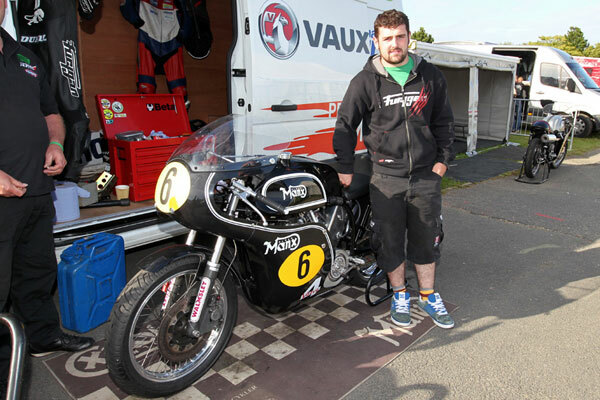 Dunlop also got an earlier lap in on the Manx Norton he’ll ride in the 500cc race. Each of the six classic races have ten nominated seeded riders who will occupy the first ten start places with the qualifying sessions determining the remaining start positions in each race. An international field of newcomers, who earlier had their speed-controlled lap at the beginning of the session, went out for their first proper lap. They included Herman Verboven from Belgium, Finland’s Jussi Luoma, Hans De Witt from Holland, Ronald Van Looey (Belgium), Kenny Hinck from Germany and a group of Australian newcomers including Cycle Torque Magazine journalist Christopher Picket, Alan Johnson, Mick Heason, Russell Fairburn and Noel Heenan who was riding an ex Jack Findlay Yamaha. UK based newcomers getting their first lap of the TT Mountain Course included England’s Keith Clarke, Richard Ford, Christopher Dixon, Adrian Morris, Roger Birkinhead, Steve Dobie, Rob Padgett, Richard Wilson and Adrian Morris. Tomorrow’s session sees the Classic machines away at 18.20 in the first timed session for all classes. The race schedule sees the much-anticipated Bennetts 500cc race on Saturday 24th August with the combined Okells 350/250 race and the Motorsport Merchandise Formula 1, 2 and Formula Classic Races both on Monday.